Product Description: With interchangeable modular components and built in diagnostic to help troubleshooting, the MOD GPX greatly reduces it's maintenance needs and downtime. A durable build and the capability to place up to 70 straps per minute make the MOD GPX one of the finest machines in it's class. Product Description: Fully automatic with fewer parts. The PC1000 is a very reliable, highly durable strapping system that can place up to 65 straps per minute with added features to ensure that it rarely needs downtime. 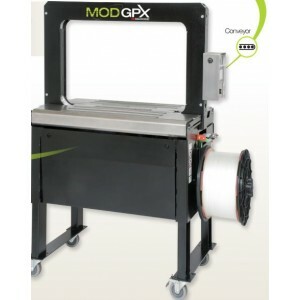 Product Description: The simplest, most reliable general-duty strapping machine on the market today. With 40% fewer parts, jam resistant technology, and more timesaving features, the HBX-4300 machine simplifies operation and maintenance to save you time and money. 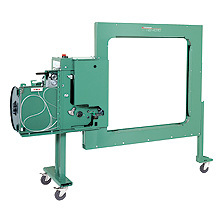 Product Description: Simplest, most reliable fully automatic general-duty strapping machine on today's market. Like the 4300, it has 40% fewer parts, jam resistant technology and time saving features. Product Description: 70 strap/min semiautomatic and automatic general-purpose strapping machine for 5 and 6mm polypropylene strapping with easy coil loading and jam resistant technology. Product Description: Semiautomatic and automatic general-purpose strapping machine for 5 and 6 mm polypropylene strapping running at 70 straps/minute. The 2300 refeeds automatically and utilizes patented jam-resistant technology to reduce maintenance needs. Product Description: Fully automatic general-purpose strapping machine for 5 and 6mm polypropylene strapping. Runs up to 70 straps/min with automatic loading and automatic cut and refeed option. Patented jam resistant technology decreases maintenance needs and increases productivity. Product Description: Simplist, most reliable corrugated strapping machine in it's class. Like the 2300 series, it has 40% few parts, easier to use features that speed operations and reduce maintenance needs. Product Description: Side seal, heavy duty, general-purpose plastic strapping machine for 9 and 10.5mm polypropylene strapping. Features automatic cut and refeed option, along with fully accessible strapping head and strap path. Product Description: Designed in a rugged, versatile manner to feed strap around your package to improve manual operation efficiency. Product Description: Semiautomatic table-top strapping system. Uses inexpensive 1/4", 3/8" and 1/2" polypropylene strapping. Very low maintenance with simple and flexible operation. Product Description: Entry level, semiautomatic, open cabinet, table-top strapping system. Uses inexpensive 1/4 in., 3/8 in. and 1/2 in. polypropylene strapping. Always safe and reliable. Product Description: Strainless steel, side sealer using inexpensive 1/4", 3/8" and 1/2" polypropylene strapping. Unique frame design provides exceptional sturdiness and durability with simple operation and very low maintenance.